Some time back, my father's mother and sister and my mother's brother all passed away within the space of a year. One day my father called me to his studio and asked me, "Why am I going through this tragedy?" "Krishna," I replied, "is trying to warn you that the material world is just temporary and that you can leave your body at any time. So you should take advantage of your human birth and practice spiritual discipline while, you've still got the chance. And the best way to accomplish this is to chant Hare Krishna." He agreed to try, and from then on he chanted on his beads every day. Again and again he would tell me how grateful he was that I had introduced him to Krishna consciousness—how it had deeply affected his life and the lives of many of his friends. A few months later, my father was driving my family to Vermont to see his dying brother, when my father blacked out and swerved off the road. At the hospital the doctors discovered he had cancer—a malignant brain tumor. My sister called and told me, "Dad has cancer, and the doctors say he has, at most, six months to live." I was shocked. It was totally unexpected, as he was only sixty and quite fit for his age. My father was a professor of architecture at Smith College, where he had been teaching for the last twenty-five years. He had worked hard to support a family of seven and to maintain an old farmhouse on seventy-five acres. Now, despite his condition, he still hoped to keep teaching for a couple of years and then retire. But these plans crumbled as his condition became more and more critical. He consulted many doctors, looking for some cure. He went to an acupuncturist, many charlatans, and even a health institute, where each doctor recommended his own "sure cure." Meanwhile, the tumor was growing fast, and he decided to have an operation, even though the doctor would not make any promises. He might live; he might not. He might never be able to speak again. In effect the doctors were indicating to us that we should be prepared for the worst. My father survived the operation, and the pain subsided a little. But the operation had taken its toll. His condition worsened. He lost his ability to read. Speaking became extremely difficult. Late one fall afternoon he told my mother and sisters he was going for a jog down an old dirt road near our house. Several hours later they found him a half-mile down the road, lying face down in a ditch. My sister lifted him up. He was unconscious, and his face was covered with blood. As he opened his eyes, he didn't know where he was or what had happened. When I heard about this, I was living in the ISKCON center in Boston. My father's death seemed imminent, so I took the first opportunity to go and see him. After a big religious celebration at the temple one day on November 12, 1983, I gathered all of the transcendental flower garlands and some of the charanamrita (sacred water) from the festival and brought it all to my father. When I arrived at home and entered his room, I found him lying motionless in bed, his eyes wide open and glaring upwards. He sensed my presence and strained to smile, I put the garlands on him and around the bed. He squeezed my hand. His temperature was high, and he was breathing heavily. All he said to me was "Hare Krishna." Two days later, on a very auspicious day (the disappearance anniversary of three great, saintly teachers), my father passed away. He had Çréla Prabhupada's red rose garland around his neck, the sacred tulasé garland that had been worn by the Deity of Lord Krishna on his chest, japa-mala (prayer beads) in his hands, and a large picture of Radha and Krishna above his bed. And he was hearing kirtan (devotional prayers) sung by the pure devotee Srila Prabhupada. The last thing I heard him utter was "Hare Krishna." I remembered Lord Krishna's words in the Bhagavad-gita: "Whatever one remembers at the time of death—that state he will attain without fail." ( Bg. 8.6) Taking everything into account, I consider my father's death an auspicious event. Shortly afterwards, family and friends from around the country arrived for the funeral service, packing an old New England church with four hundred people. It was mainly a Christian group, some of them churchgoers, some not. Many wore gray flannels and blazers. The mood was solemn. After burying the ashes at the cemetery, the congregation went to the church, where in a deep, resonant voice the priest led everyone in singing psalms and reciting passages from the Bible. "If my father were here today, he would want me to speak openly and transmit his presence and the presence of our Almighty Supreme Father, God, in the most enlivening way possible. I remember my father for a very rare and attractive quality he had. I can best describe it by remembering our relationship. More important than being responsible for giving me this body, he directed me to spiritual life and encouraged me in it. I remember that in my childhood He never told me I should become like him—an architect, a football star, a Harvard man, head of a big family. In fact, he confidentially told me that the burden he had taken on—although he considered it a burden of love—had deprived him of an opportunity to pursue what he described as 'the deepest essence of human life.' So he told me he hoped I would some day do what he couldn't. I have probably said this before, but if so, pardon the repetition. My visit with you there was a very moving, total experience, and I know I will never be the same again. I think you all are a tremendously impressive and dedicated group of young men and women, who have dedicated your lives in as total, beautiful, and significant a way as anyone possibly could. Also—I am certain the world is helped more by the kind of devotion you are giving each day to the world around you than it is helped by most other human efforts. There must be times when your own inner struggles are extreme and when the behavior of others on the outside, like me, is very disheartening and frustrating to all of you. It is hard for me to imagine what a totally transformed human being you have become and what your inner life and value system—your whole world of meaning—must be. Please don't be too harsh on those of us who, for one reason or another, have no been able to make the total transformation that I am certain you would like to see come about. "Over the years," I continued, "our relationship became closer and closer. 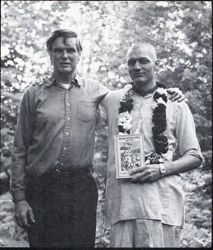 Whenever we met, he would ask one thing from me—that I would chant Hare Krishna with him. He also enjoyed chanting with my mother. The Bible says, 'Our Father, who art in heaven, hallowed be Thy name. God's name is always considered sacred. "The name Krishna in the Hare Krishna chant is a name for God that means 'the All-Attractive One.' It is from the Sanskrit language, the oldest language in the world In essence, when we chant Hare Krishna we are calling upon the Lord: 'Please engage me in Your service.' When my father left this world, he was hearing this prayer, am therefore I am sure he is with our Supreme Father, God, Krishna. "I am sure my father and our Supreme Father would be pleased if we all said this beautiful prayer in their honor. I will repeat two words at a time, and then every one can respond. Don't be shy or there will be a dead silence, and it will be very embarrassing for me." I led them in chanting—Hare Krishna Hare Krishna, Krishna Krishna, Hare Hare Hare Rama, Hare Rama, Rama Rama Hare Hare. Practically everyone joined. It was wonderful. As the holy name of Krishna, resounded, I turned around and, to my surprise, saw the priest, who had been so apprehensively seated behind me earlier also chanting along. Afterwards he gave me a bear hug in front of the congregation. Five hundred years ago, Lord Chaitanya Mahaprabhu (Chaitanya Mahaprabhu is Krishna Himself in the role of His own devotee. He appeared in India five hundred years ago to teach love of God through the chanting of the Hare Krishna mantra) predicted that in every town and village the chanting of the holy name would be heard—even in a little village in New Hampshire. And now I had seen at least a little of this prophecy come true. After the service, everyone filed out of the church, and I was mobbed with many hugs and congratulations. I hadn't seen many of these people since my childhood, so I couldn't recognize many of them. But they all remembered me. It was as if I had stepped into a dream or a past life I had almost completely forgotten. Never, in all my years of church-going as a child, did I walk out of a church feeling so enlightened and refreshed. This time the whole congregation seemed to be emanating a glow instead of the customary gloom. Afterwards, there was a party, where many people accepted Krishna-prasadam (food offered to Krishna) and some of Srila Prabhupada's transcendental literature that I had on display. Some of the still-sober people even asked philosophical questions. Since that day I have received letters and phone calls from people who said that it was an experience they will remember for the rest of their lives. Ironically, as I write this article in my room at our Miami temple, I hear music of the thirties blaring from some loudspeakers outside my window. It's the rest home next door, where the inmates use their last days baking in the sun and recalling fading memories of the past. Their attempts at happiness appear vain and childish, the women with bright lipstick, and heavy makeup on their pale, withered faces, and couples dancing with their aching, swollen bodies to a song about young love. Every day the sirens come howling, the ambulance appears, and the orderlies scoop up another corpse. What an inglorious and embarrassing way to die! I feel very happy that my father was interested in Krishna consciousness and that he intelligently decided to spend his last days glorifying God by chanting His holy names. Death is usually a gloomy event that we prefer not to talk about. But due to the transcendental influence of the holy names of the Lord, and by the mercy of the pure devotee Srila Prabhupada, what is ordinarily a tragedy became a spiritually purifying and enlightening event. You also should take up this joyful process of chanting the holy names of the Lord and make your life sublime. After all, you never know when you'll have to go.